The Race to Victory Lane Sweepstakes is for the legal residents of the United States and for those who are at least 18 years of age or older at the time of Sweepstakes entry. The Race to Victory Lane Sweepstakes started from 22nd May, 2018 at 12:00 PM Central Time (CT) and finish on 27th May, 2018 at 11:59 PM Central time (CT) (the Sweepstakes Period). 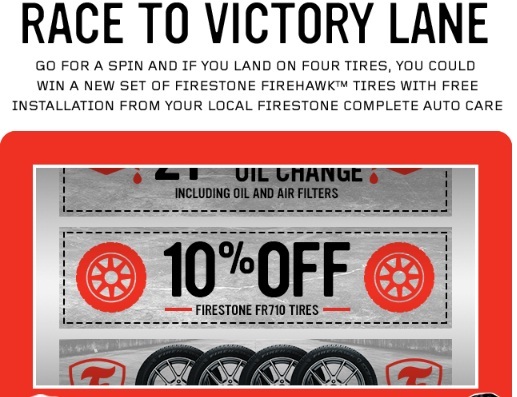 The Prize for the Sweepstakes winner is set of 4 Firestone Firehawk Tires. By participating in this Sweepstakes, entrants are unconditionally accepts and agrees to comply with and abide by the Official Rules and the decisions of the Sponsor. The use of any device to automate the entry process is prohibited and it will cause disqualification. Eligibility: Open only for those who are the legal residents of the United States and for those who are 18 years of age or older at the time of entry.